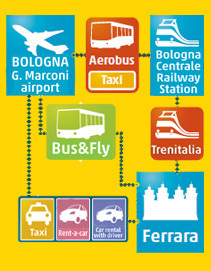 The easiest way to get to Ferrara. Connect the Airport Guglielmo Marconi (BLQ) of Bologna with the historic centre of Ferrara. Timetabled departures guaranteed. No charge for baggage. Children under 1m tall travel free if accompanied by an adult. 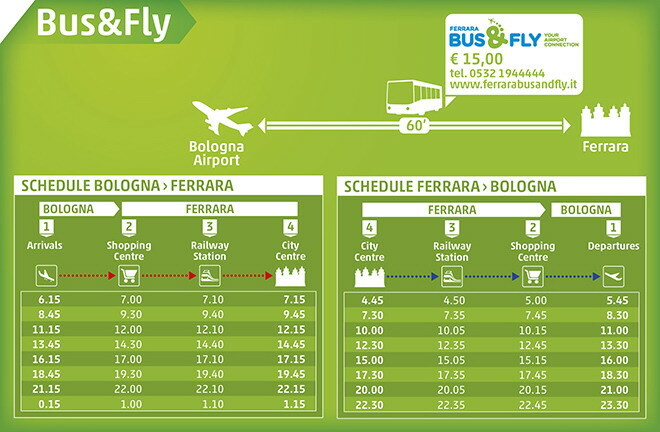 One-way ticket € 15,00. Group reductions available. Roughly two trains every hour (from 6 am to 11 pm). Rates for Taxi / Car rental with driver services are agreed directly with the client. Weekdays: 9.00-18.00. Sundays and and holidays: 9.30-17.30. Closed December 25th. January 1st open 13.30-17.30. Choose among hotels, B&B, guest houses, holiday farms, hostels,camping sites, residences, tourist villages, houses and apartments,apartments for tourist use.